The sixth Running of the Bulls of Sanfermin 2015 with the El Conde de la Maza bull-ranch was fast and clean and there was some spectacular and thrilling running to be seen. On the first stretch at Santo Domingo the Conde de la Maza bulls were already showing a very fast pace as they moved up the slope. They looked threateningly at the runners but did not make any direct charges at them. Soon the pack began to loosen up and three bulls and a steer moved ahead to lead the rest of the way. There was some fine running to be seen, although one steer knocked over several runners along Estafeta Street. The first medical report confirms that, for the moment, only one runner is being treated for contusion and bruising at the City Hall stretch. 2 running bulls. 0 goring. 2 traumatisms. The 160th time that there were no gorings in a running of the bulls. The previous was on 07/10/2015. The 47th fastest running of the bulls. The 1st was on 07/13/2011. In 2 participations the Conde de la Maza have never caused gorings. 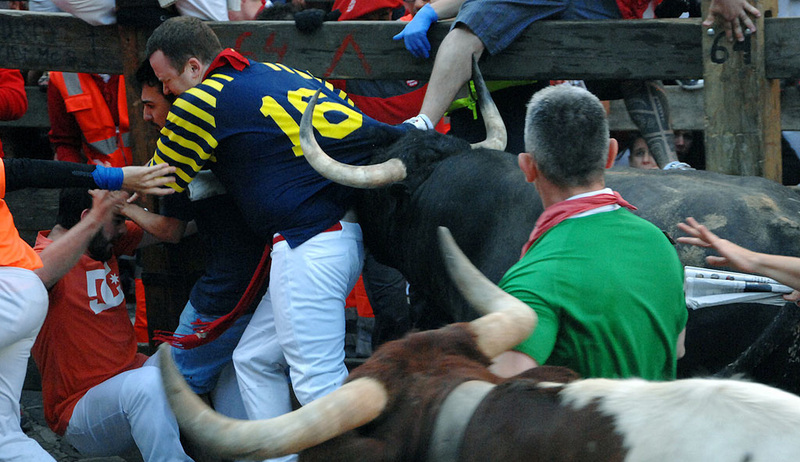 The 19th time that there are no gorings in a running of the bulls held on 12th of July. The 6th fastest running of the bulls ever held on Sunday.